Success doesn’t just happen overnight nor does developing the right mindset or motivation to achieve it. We can only wish it was that simple. If you want to be successful in anything, you need to change your thinking into that of a person who doesn’t get sidetracked nor overwhelmed by challenges. Life is all about facing challenges and overcoming them. That’s what seperates the winners from the losers. And it’s what seperates the successful ones from those who gave up halfway. The strongest thing you have is your mind and when everything is on point, your mind is what will take you forward towards achieving the goals you set forth. 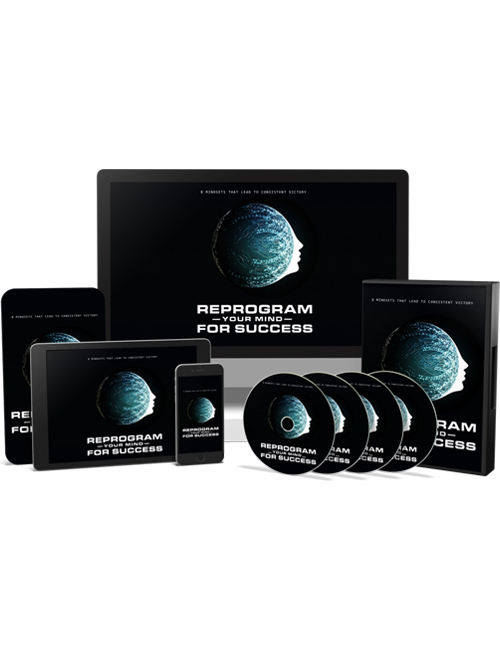 With this video course which supplements the Reprogram Your Mind Ebook, you will get a complete mind cleansing so you can mentally reset and charge forward, eliminating all the negatives that were holding you back. Easier said than done but there has to be a starting point and that starting point is here with this guide. You will learn about the power of optimism, how to get focused and keep your focus during the most difficult of times, how to overcome the obstacles you may face and smash right through them, how to think like a true winner and much more. You need a solid boost to get you going and this course is definitely a heck of a good booster to get you right off the starting blocks. Get it now.